Time was, 100 watts was a lot of power. Today, more and more mid-sized amps with 500 watts output are becoming popular. 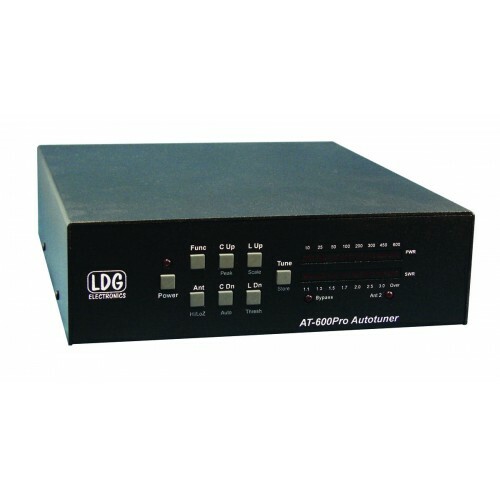 The LDG AT-600Pro is designed for this new generation of power levels. The AT-600ProII will handle up to 600 watts SSB and CW and 300 on RTTY (1.8 – 30 MHz) and 250 watts on 54 MHz. 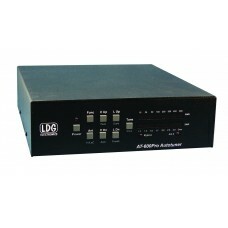 It features LDG's state-of-the-art, processor-controlled Switched-L tuner. It will match virtually any kind of coax-fed antenna, including Yagis, dipoles, inverted Vs, slopers, loops, just about anything. It will typically match a 10:1 SWR down to 1.5:1 in just a few seconds. You can also use the AT-600Pro with longwires, random wires and antennas fed with ladder line just by adding a balun. The AT-600Pro features two antenna ports with a front-panel indicator showing which is in use, and separate memory banks for each antenna. Easy to read LED bar-graph meters showing RF power, SWR and tuner status, tactile feedback control buttons and an LED bypass indicator complete the user interface. Any power source from 11 – 16 volts DC can be used; the AT-600Pro draws only 750mA during a tune cycle, much less when not tuning. · Frequency coverage: 1.8 to 54.0 MHz. · Includes DC power cable, Icom interface cable and coax jumper.